30 Motions, 10 kicks, 4 punches, 2 keup. Turn 90° left, moving left foot into a left back stance (Dwit Kubi), execute a double knife‐hand block (Sonnal Momtong Makki). Pivot on left foot, right leg low side kick (attacking the knee), right leg side kick to upper body, immediately after first kick, without touching foot down (Kodeup Yop Chagi). Step down with right foot into right forward stance (Ap Kubi), right single knife‐hand in‐to‐out strike to upper body (Sonnal Bakkat Chigi). Staying in a front stance (Ap Kubi), perform a left hand center punch (Momtong Jireugi). Shift weight and feet back into a right back stance (Dwit Kubi), perform a right arm out‐to‐in block (Montong Makki). Step back with right foot and turn 180° right (pivoting on left foot), moving right foot into a right back stance (Dwit Kubi), double knife‐hand block (Sonnal Montong Makki). 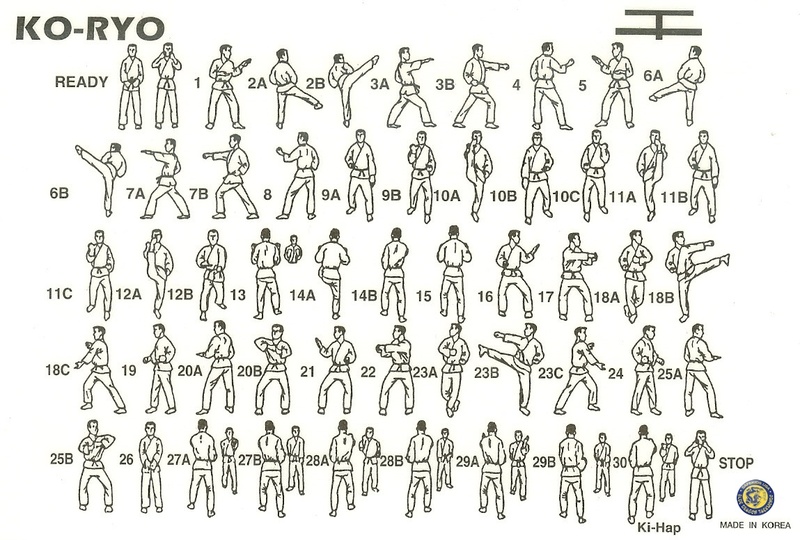 Pivot on right foot, left leg side kick (attacking the knee), left leg side kick to upper body (Kodeup Yop Chagi), step down with left foot into left forward stance (Ap Kubi), left single knife‐hand in‐to‐out strike to upper body (Sonnal Bakkat Chigi). In the same stance (Ap Kubi), perform a right hand center punch (Momtong Makki). Shift back into a left back stance (Dwit Kubi), left arm out‐to‐in block (Momtong Makki). Turn 90° left, moving left foot into a left forward stance (Ap Kubi), left arm low knife‐hand block (Han Sonnal Arae Makki), perform an arc‐hand attack to the throat (Khaljaebi). Perform a right leg front snap kick (Ap Chagi), step down with right foot into right forward stance (Ap Kubi), right arm low knife‐hand block (Han Sonnal Arae Makki), left arc‐hand attack to the throat (Khaljaebi). Perform a left leg front snap kick (Ap Chagi), step down with left foot into left forward stance (Ap Kubi), left arm low knife‐hand block (Han Sonnal Arae Makki), right arc‐hand attack to the throat (Khaljaebi), KEUP! Perform a right leg front snap kick (Ap Chagi), step down with right foot into right forward stance (Ap Kubi), break the opponent’s knee with left low arc‐hand, holding the foot against your rib-cage with right hand (Mureup Kkeokki). Advance the left foot in a step forward, and pivot on right foot, turning body 180° right so that right foot is now forward, facing South. Step down and back with left foot into a right forward stance (Ap Kubi), double outside body block (Anpalmok Momtong Hecho Makki). Left leg front snap kick (Ap Chagi), step down with left foot into a left forward stance (Dwit Kubi), break the opponent’s knee with right low arc‐hand, holding the foot against your ribcage with left hand (Mureup Kkeokki). Pull left foot back into a left walking stance (Ap Seogi), double outside body block (Anpalmok Momtong Hecho Makki). Turn 180° right (using left foot as axis), moving right foot into horse riding stance (Juchum Seogi), left arm single knife‐hand side block (Hansonnal Momtong Yopmakki). Still on a horse riding stance (Juchum Seogi), right hand cross‐body side punch to upper body, using left hand as target (Jumeok Pyojeok Jireugi). Sidestep, crossing right foot in front of left foot (Ap Kkoa Seogi), cross‐body close front punch: forcefully move right fist (palm‐up) to right hip (as if performing rear elbow strike), and move left fist across front of body toward right hip, palm‐down, elbow bent 90 degrees, left foot side kick (Yop Chagi), step down with left foot, turn body to the right to East direction, assuming right forward stance, left spear‐hand (palm‐up) attack to the groin while pulling opponent’s arm to your upper shoulder with right hand (Pyon Sonkkeut Arae Jecho Tzireugi). Pull the right foot back into a right walking stance (Ap Seogi), right arm lower block (Arae Makki). Step forward with left foot into a left walking stance (Ap Seogi), left hand low palm‐heel block (Batangson Nullo Makki), after palm‐heel block, step forward with right foot and turn hips toward North into a horseback riding stance (Juchum Seogi), right arm side elbow strike (Palkup Yop Chigi), supporting the right fist with left knife hand’s palm. In a horse riding stance (Juchum Seogi), right arm single knife‐hand side block (Han Sonnal Momtong Yop Makki). In a horse riding stance (Juchum Seogi), left hand cross‐body side punch to upper body, using right hand as target (Jumeok Pyojeok Jireugi). Sidestep, crossing left foot in front of right foot (Ap Kkoa Seogi), cross body close front punch: fix left fist palm‐up at left hip, and move right fist across front of body near left hip, palm‐down, elbow bent 90 degrees, right foot side kick (Yop Chagi), step down with right foot, and turn body to the left (to West), assuming left forward stance (Ap Seogi), right spear‐hand (palm‐up) attack to the groin while pulling opponent’s arm to your upper shoulder with left hand (Pyonsonkkeut Arae Jecho Tzireugi). Pull left foot back into a left Short stance (Ap Seogi), left arm lower block (Arae Makki). Step forward with right foot into a right Short stance (Ap Seogi), right hand low palm‐fist block (palm‐down, blocking low front kick), after palm‐fist block, step forward with left foot into a horseback riding stance (Juchum Seogi), left arm side elbow strike, supporting the left fist with right knife hand’s palm (Palkup Yop Chigi). Perform this movement slowly, with good balance, concentration, and power. Slowly pull right foot inward to the left foot into a ready upright stance (Moa Seogi), bring both arms up over head, outstretched, with left hand in hammer‐fist, right hand in knife fist. Slowly move arms outward to the sides and down in a large circle, and attack waist level with left hammer‐fist, using right knife‐hand palm as target. (Mejumeok Arae Pyojeok Chigi). Feet and hands should come together at the same time. Turn 180° to the left (pivot on right foot), moving the left foot around into a left forward stance (Ap Kubi), left hand single knife‐hand in‐to‐out strike to the neck (Han Sonnal Bakkat Chigi), left arm knife‐hand lower block, palm‐down (Han Sonnal Arae Makki). Step forward with the right foot into a right forward stance (Ap Kubi), right hand out‐to‐in knife‐hand attack to the neck (Sonnal Mok Chigi), arm knife‐hand lower block (Han Sonnal Arae Makki). Step forward with left foot into a left walking stance (Ap Seogi), left hand out‐to‐in knife‐hand attack to the neck (Sonnal Mok Chigi), arm knife‐hand lower block (Han Sonnal Arae Makki). Step forward with right foot into a right walking stance (Ap Seogi), right arc‐hand attack to the neck (Khaljaebi), KEUP! Moving left foot, turn 180° counterclockwise to return to pushing hands ready stance (Tongmilgi Junbi Seogi).